Don't miss Paramount Pictures' CAPTURE THE FLAG out TODAY! Rated PG FOR ACTION, LANGUAGE AND SOME THEMATIC ELEMENTS. CAPTURE THE FLAG is inspired by the 1960s space race and sees a ruthless billionaire bent on exploiting the source of Helium 3, the clean energy of the future. His plan involves rewriting history to excise the feats of the Apollo XI astronauts and the Moon landing. Enter headstrong 12-year-old surfer, Mike Goldwing, who along with his friends, a small lizard with delusions of Godzilla-like grandeur, and his grandfather, travels to the Moon to thwart evil. Jordi Gasull, a co-writer on The Last Explorer, is creator and co-scripter. Costumes are by Debra McGuire. The movie was produced by Donna Gigliotti and James Spies. Executive producers are Joseph Craig and Jean Morrissey. Witty and Heartwarming. These are the two words I used to describe this enchanting movie. It was early Saturday morning when I woke my six-year-old son up to get ready for the screening of this movie. I was really excited that I would be able to share a special moment like this with him and he seemed as excited as I was. Arriving at Universal City Walk was exciting – I had never taken my son there despite having it 20 minutes from our back yard, and it did not disappoint. The store names were twice their normal size and I have always felt like I was walking onto a movie set when there. As we made our way into the assigned theater, we noticed a table filled with crayons and coloring pages, so we each grabbed a sheet and a handful of crayons and went to our seats. Ten minutes later, our sheets were colored and the theater went dark and the movie began. My first thought was, “Oh my gosh! This is so cool!” especially since it starts with a recap in black and white of what had happened with astronauts back in the 60’s. Then, we are taken to the present day where we meet Mike Goldwing, a 12 year old with some fierce friends who are always up for an adventure. 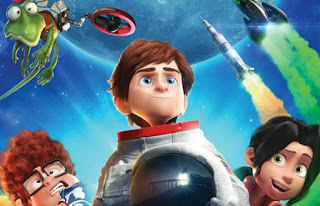 We come to find out a little bit more about his family – his father is an astronaut and he has a mother and little sister. We also learn that his grandfather was an astronaut in the 60s and was supposed to be on the space shuttle that went to the moon, but for some reason he never went and disappeared from his family’s life. Mike enlists his friends to help him reunite his dad and grandpa and cause quite the stir to be able to make this happen. Already I liked this movie, especially since it had a strong emphasis on the importance of family and that families need to be there for each other, no matter what. Then, they find out that a wealthy billionaire is planning on making a trip to the moon and the President stresses the importance of the astronauts landing on the moon again. A race to the moon is what ensues next, and Mike along with his friend Amy, sneak onto the space shuttle only to be caught by Mike’s grandpa. To make matters worse, the evil billionaire paid off a man from the paparazzi to lock the shuttle and send it off to space ten hours before it was set to launch! Little do they know that Mike, Amy and grandpa Goldwing are on that shuttle! Now, I don’t want to give the entire movie away, but I will end this by saying I highly recommend this movie. Not only is it extremely family friendly, it also has plenty of laughs that grown ups can enjoy as well. Don’t be surprised if you end up leaving the movie theater with a lump in your throat as well as thinking about that distant relative or parent, sibling, cousins, etc. that you might have lost touch with. With the holidays upon us, this is the perfect movie to enjoy as a family!